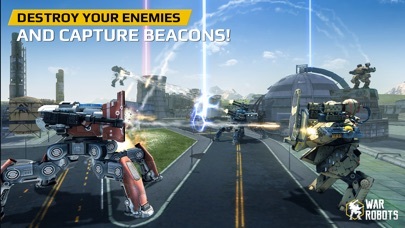 War Robots is an action-packed multiplayer game with 6 vs. 6 team battles in real-time! Join the ranks of the Mighty Warriors! “Saddle up, pilot! 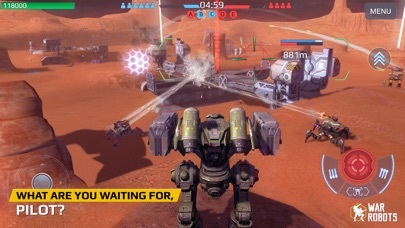 It’s time for some mechanized, armor plated, missile firing, machine gun shooting, nuclear powered fun.” - Technologytell “War Robots is a fun online multiplayer zone capture game with energetic robot battles.” -Engadget “This one could break big, so educate yourself now.” - AppSpy “A mechanized MMO battler with some teeth.” - 148apps.com “If you like Robots and real-time PvP battles, the game will be your best choice.” - 2P.com It's a time of war, pilot! Are you ready for surprise attacks, intricate tactical maneuvers and the many sneaky tricks your rivals have in store for you? Destroy enemy robots, capture all the beacons, and upgrade your weapons to increase combat strength, speed, and durability of your battle robot. Prove yourself in each map and use different strategies and tactics to emerge victorious from battle! MAIN FEATURES: – 45 battle robots with different strengths; – more than 50 weapon types, including ballistic missiles, energy and plasma guns. What will you choose? – many possible combinations of robots and weapons. 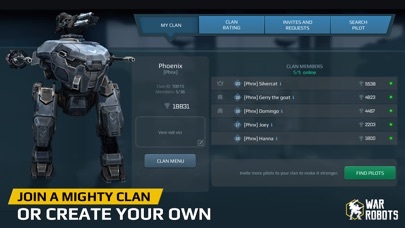 Create a war machine to fit your own play style; – create your own clan and lead it to glorious victories; – join epic PvP battles against rivals from all over the world; – complete military tasks for bonuses and earn the Best Pilot title. Onward, soldier! Victory is yours! You want to talk about the game or find allies? 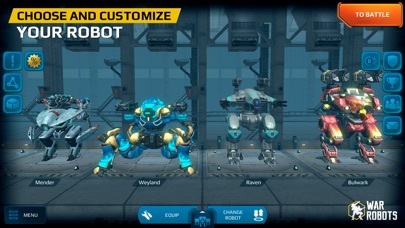 Then join us on Facebook: https://www.facebook.com/warrobots/ or follow us on Twitter: @WWR_by_Pixonic and YouTube: https://www.youtube.com/user/WALKINGWARROBOTS Important note: This application requires a stable internet connection. In case of any problems, please contact us at wwr_support@pixonic.com so we can work on a fast resolution. Enjoy the game! I love the robots! 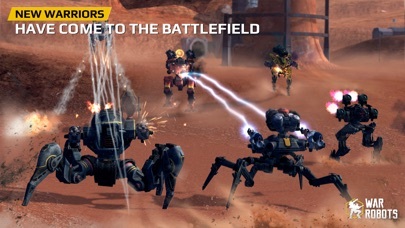 When I need shelter, I can always count on spider robots. Thank you for thinking that some robots need shields! The game concept is great and the control dynamics are fluid, a lot of fun. But the power spectrum between coiners and free to play or (low investment) players is too large. No amount of good piloting can make up the difference between an old gen bot and decked out $400 new bot. Also, the black market drop rate is atrocious! If you want something that takes components well have fun playing for 4 years. Also, you would expect that the loot boxes would be better but 97.9999999 of the time you get silver. I don’t know why I have been experiencing the connection issues in the middle of battles. Absolutely frustrating to pay for a game that can not stay connected while I have WiFi and full LTE service. By A dude who likes games. This is not my first review of this game, but it’s changed a lot in the last few months. Gameplay is still fantastic, but sometimes matchmaking can take over a minute for a 10 minute game. The new workshop is good, I’ve got one of the best robots in the game from it and another on the way, but I’m worried about the future. This is about to get complicated. So, a few months ago Pixonic added active modules. The modules are a healing module, a lock-down ammo upgrade, and a anti-stealth ability. The modules require fuel in the form of green chips to activate. You can buy these with gold or real money. Here’s the problem: one of the bots for the next update has unlimited stealth. The only way to counter stealth is the anti-stealth module which is expensive to use. I think this is another example of Pixonic trying to extort players. TL-DR: the game is a little better that it was, but the next update is going to make life hard for free-to-plays. Cool game but like every multiplayer game you will be teamed up with a no show, someone three days off their ADD meds, a completely low functioning we Todd, a so so player, a real player, and you the high score every match guy that has lost five in a row because of the above %#*&@!